After meeting your guide, you will do a short training to feel more confortable with the machine. When you're ready, we go on the tour to see the biggest Park of Madrid, Casa Campo. 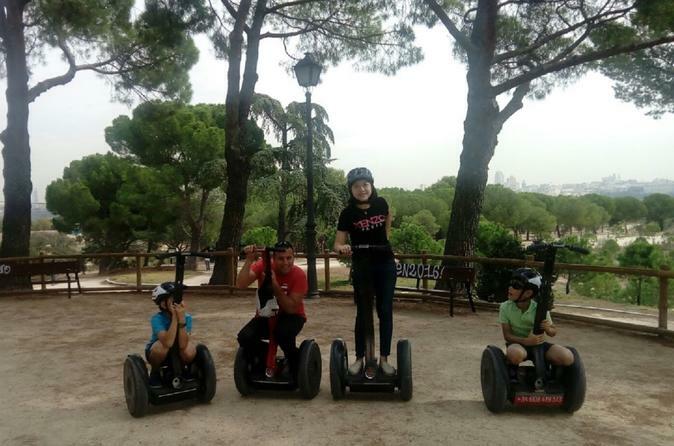 You will be able to enjoy a complete experience with a segway in this green area, and discover all the best places of the park : the lac, the great panoramic view, and more ! The largest green extension of Madrid is located a short distance from downtown. It is a historic garden and the largest public park in the municipality of Madrid. It duplicates the extension of the Bois de Boulogne, it is five times bigger than Central Park and six times bigger than Hyde Park. It is synonymous of fun and free time for the locals, since inside there are Madrid Theme Park, the Zoo, the Cable Car and many sports facilities for public use, as well as the Madrid Arena pavilion. In the past it was a hunting ground for royalty, but after the proclamation of the Republic in 1931, it was ceded to the people of Madrid. If you want to enjoy a natural environment driving the in the most funny conveyance , this is your tour.